I apologise for the very poor quality of this shot but I think the importance of the light and the circumstances under which the image was acquired justify its inclusion. This shot was taken at the end of an eastbound transatlantic aboard RMS Queen Mary 2 on 18 September 2010. 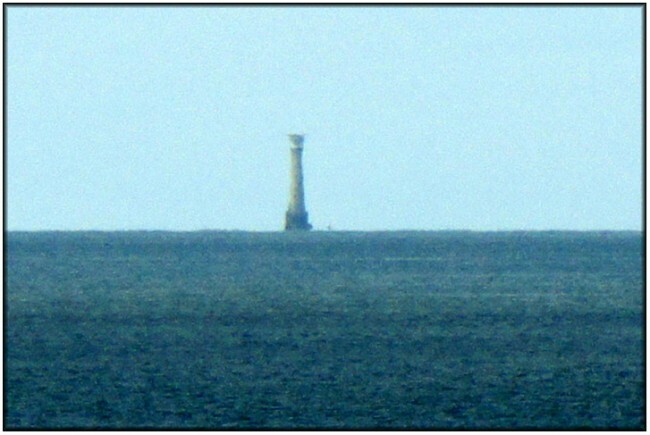 Our UK landfall was made at around 1700hrs when I managed to get my first sighting of the Bishop Rock Lighthouse at a range of something like 15 miles. I was at the highest point of the ship on 14 Deck when this photo was taken which goes some way to explain why most of the lighthouse is visible even at that range. The Bishop Rock Lighthouse is important on a wide range of different levels so it’s a little hard to know just what to say about it within the rather limited space available on a site like this. It is, in effect, the extreme south westerly point of Great Britain; it marks the eastern end of the old transatlantic shipping route over which liners could qualify for the award of the Blue Riband – the western end was the entrance to the Lower Bay in New York. After Eddystone, it is Britain’s tallest lighthouse at 167 feet; and the Guinness Book of Records cites the Bishop Rock on which the lighthouse stands as the smallest island in the world with a building on it! The present lighthouse is actually the second to have been built on the site, the first one, on which construction began in 1847, having been washed away in a ferocious storm on 5 February 1850 before its light had even been lit. Construction on the new tower began the next year to the design of James Walker who had also designed the ill-fated original. This time though he opted for stone as his building material rather than cast iron, and his second attempt proved to be a little longer lasting than his first. Building took some seven years, the light eventually being lit on 1 September 1858. By 1881, however, Walker’s tower was beginning to reveal some flaws. An inspection carried out that year by Sir James Douglass (probably, along with Robert Stephenson, Britain’s most important lighthouse engineer) revealed extensive damage and weaknesses in the structure. He therefore produced a plan to reinforce the structure and, simultaneously, to increase the elevation of the light by some 35 feet. The plans were complex but, put simply, they involved building what was, in essence, a completely new tower, using the original as the core. Major work was also done to reinforce the foundation which represented the biggest weakness of the existing tower and Douglass did this by producing a very large, cylindrical base that acted as a buffer on which the force of the waves could be largely dissipated before striking the tower itself. This work began in 1882 and was completed in 1887, the work actually being done under the direct supervision of Douglass’s son William. So, the tower that we see today, is really the third on the site, although the previous tower is, of course, still there, safely encased in the present structure. This rock lighthouse was always a particularly difficult one to reach by boat and crew relief and resupply of the station was always complicated and frequently delayed by the weather. For this reason, in 1976, Trinity House constructed a helipad on top of the tower, above the lantern (it can just be made out in this image). In 1991 the light was converted to fully automatic operation and the last keepers left the station on 21 December 1992. Finally, in 2007, the fog signal was discontinued, rendered more or less unnecessary by modern navigation aids. The current light is provided by a 400 watt MBI lamp of a type that is commonly used in sports stadiums because of its good colour rendering properties. This is a high-intensity-discharge metal-halide lamp in which, unless I’ve got it entirely wrong, a combination of bromine and iodine (the halide bit) are used along with the mercury (the metal bit). The light produced by the lamp is rated at 600,000 candela and is projected through a 1300mm hyper radial rotating lens that produces two white group flashes every 15 seconds, visible at a range of 24 nautical miles.